Become a MFTHBA Carded Judge! Are you interested in judging Missouri Fox Trotting Horse classes? 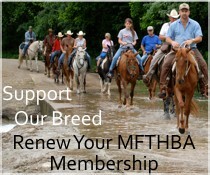 The MFTHBA offers a training program to teach and certify judges. Upon meeting the above requirements, a Judge Apprentice card will be issued.An apprentice must judge a minimum of 3 MFTHBA-approved shows under the supervision of MFTHBA carded judges with a minimum of 6 classes. The apprentice must complete this requirement in no more than 36 months.Once an applicant successfully completes all the requirements, the apprentice must be recommended by the MFTHBA carded judges under whom the applicant apprenticed to the MFTHBA Board of Directors for final approval. The MFTHBA Board of Directors will provide final approval for the issuing of the full judges card. Additional endorsement for versatility and/or ranch horse may also be added if the applicant is qualified.Additional information about the process and the process for renewing an issued judges card can be found in the MFTHBA Rule Book . Need to renew your card? Complete the Judges Renewal Application on the Judge’s Forms and Downloads page. Have an interest in becoming a M.F.T.H.B.A. carded judge? Then you are invited to participate in the 2018 Judge’s Clinic! On Saturday, live demonstrations by the breed’s top trainers will provide an educational experience for performance & model divisions. Experienced judges and trainers will be “partnering” to define the standards of the Missouri Fox Trotter & demonstrate the variances in gait & conformation that our competing horses exhibit in the performance show ring. Information will also cover “how to judge”: covering rules, procedure, etiquette, & accountability. Sunday will cover a review portion & then will move into a clinical “horse show”. Each class will be broken down with explanation as the “judge’s in training” turn in their results. This is a great opportunity to get “hands-on” training as you take on the responsibility from center ring. Already have a judge’s card? Or had one in the past that needs to be renewed? You are welcome to attend too! Attendance will be recorded in your judge’s file as continuing education. If you would like to attend but do not intend to apply for a judge’s card you are welcome to view the clinic. Bring a chair and plan to attend for a $10.00 viewing fee. R.S.V.P. to Stephanie Hollandsworth-Follett by calling 636-448-2288 or emailing follettstephanie74@yahoo.com. Alias Smith and Jones Ranch is conveniently located just 16 minutes from the intersection of I-44 & US Hwy 65 (Springfield, MO), 1 hour from the MFTHBA Show Grounds & 38 minutes north of Branson, MO.